I was born in Indonesia, educated in The Netherlands and came to Canada in 1960. My degree in Fine Arts is from the Royal Academy of Fine Arts, The Hague, The Netherlands. Group and solo exhibitions in The Netherlands, Germany, England as well as several in Canada. Above: Amélie works with French dyes on silk to create a rainbow of colours. 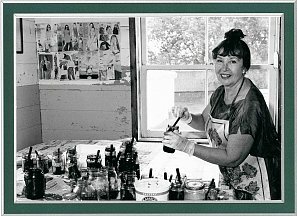 I work in oils, watercolours, lithography, etching and French dyes on silk. My boutique is in Bloomfield, Prince Edward County, Ontario, Canada. It is filled with handpainted silks and artwork and I welcome interested viewers to browse at their leisure.